In support of International Women's Day, the Port Stephens International Women's Day (IWD) Scholarship Program aims to encourage women in Port Stephens to achieve their goals and to support their valuable contribution to our communities. Port Stephens Council offers three (3) scholarships for women aged 16 years and older of $1,000 each. The scholarships are to assist a woman to achieve an important goal and contribute to their community- across arts, culture, environment, business, community, health and/or sport during 2019. 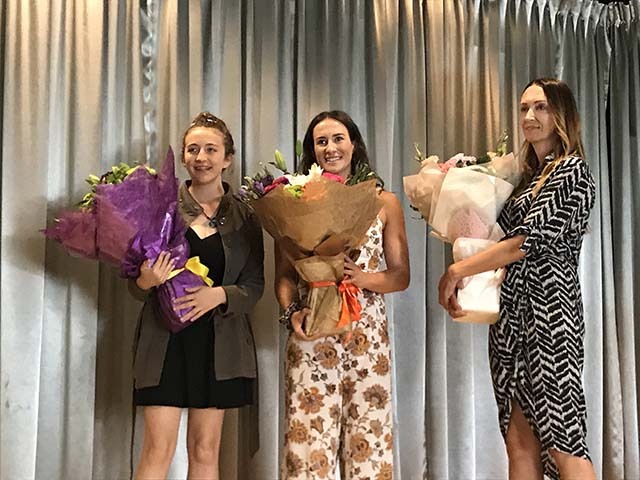 Applications for 2019 have now closed and the successful recipients were announced on Wednesday 6 March 2019 at the Rotary Club of Salamander Bay's International Women's Day lunch. Read more about the 2019 International Women's Day Scholarship recipients. Actively pursue a goal or contribute to the community in 2019. Please read the full conditions in the Port Stephens International Women's Day Scholarships 2019 Conditions (PDF 460KB). Download the Port Stephens International Women's Day Scholarships Application Form (PDF 286KB). Download the Digital images consent form from our A-Z forms page. Emily Healy, Maya Stewart and Saffron Quantrell at the 2019 IWD Ceremony. International Women's Day is held on 8 March to celebrate the social, economic, cultural and political achievements of women across the globe. The day also marks a call to action for accelerating gender parity. View the IWD Scholarship recipients for 2019. View the IWD Scholarship recipients for 2018.